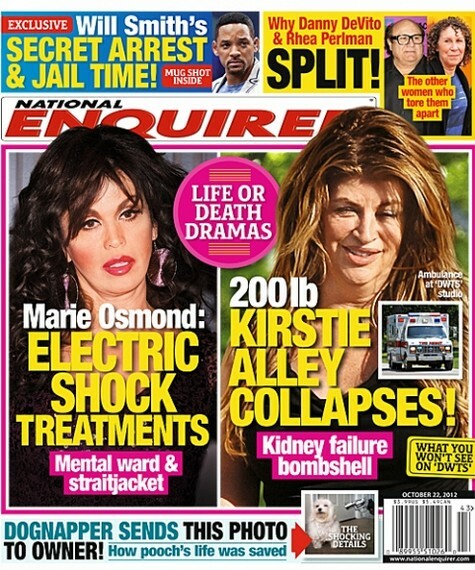 The current issue of National Enquirer features the cover story ‘200lb Kirstie Alley Collapses!.’ Has the National Enquirer been watching Dancing With The Stars All-Stars? Kirstie Alley does not look like she weights 200 lbs to me. Anyway, that is not stopping the magazine, who is still claiming that Kirstie is 200lbs. But wait! Why stop there… they go on to claim she collapsed at the Dancing with the Stars studio. They have all the details of what we won’t see on DWTS (perhaps because they did not occur), the details of the ambulance called to the set. They go on to claim that they have a bombshell for us, Kirstie suffered from kidney failure. In NE’s defense maybe this has a glimmer of truth. All the up and down weight loss/gain and yo-yo dieting must have certainly been hard on Kirstie’s health. Sounds like a big whopper to me! Groundless speculation on a slow news week to sell magazines. Did you see Kirstie’s performance last week when she danced the Jive. The jive is a notoriously tough dance and she and Maks turned in a killer performance. The NE is not only picking on Kirstie they have Marie Osmond in their cross-hairs. The magazine claims that Marie has had electric shock treatments, been in a mental ward & been secured in a straightjacket. After the suicide of Marie’s son Michael, in 2010 she went through a depression. Marie confessed that she once considered undergoing electric shock treatment in order to be cured of deep depression. She only opted against it because she was afraid she would lose pieces of her memory. A source revealed to NE: “It was only the fear of being unable to remember the lyrics to her songs onstage that made her change her mind about undergoing shock therapy and toughing it out on her own”. Marie is writing a tell all book about her life and she hopes will help other people suffering from depression. To find out all these details and more, pick up the current issue of National Enquirer on stands now! Kelly Preston And Kirstie Alley In Lesbian Affair: Revenge On John Travolta?